Here at Paradise Meadows, home of Hawaii’s Local Buzz, we enjoy watching the ABC TV show Shark Tank. It’s a show that celebrates entrepreneurs, and we can easily identify with the folks who appear on Shark Tank hoping for an investment to help take their business to the next level. We especially applaud those who are taking an innovative approach to solving a real problem. This season (Season 7), one of the entrepreneurial companies featured was Bee Free Honee whose motto is “Saving bees one apple at a time”. As beekeepers ourselves we are always interested in anything that can help to “save bees” – most of our efforts as beekeepers are dedicated to doing just that – and so we paid, perhaps, more attention than usual to their story. Unfortunately, what we heard put a bee in our bonnets, and we feel compelled to blog about that. As you may or may not know, some Vegans prefer to not eat honey, believing that the harvesting of honey violates their principles of not consuming animal-based foods. We certainly respect that decision and for those who feel that way, having a plant-based honey substitute has real value. We certainly have no objections to folks attempting to produce a syrup that tastes like honey. What we do, strenuously, object to is the claim that this honey substitute is somehow saving bees. And we were amazed that the “sharks”, including Daymond John who supposedly has some experience keeping bees, did not challenge the assertion that collecting honey from managed beehives is somehow harmful to the bees. The folks who make Bee Free Honee, who, as far as we can tell, are not and have never been beekeepers, seem to believe that bees would be able to “rest” and “recuperate” if only we didn’t take their honey away from them. That conjures up a vision of bees sitting in a lounge chair on the porch of their hives reading the newspaper instead of wandering around foraging for the pollen and nectar from which they make honey. The fact is, bees make honey. Well, worker bees make honey, and all bees other than the queen are worker bees at one stage of their very short life cycle. 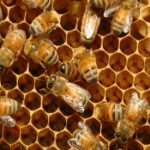 Bees live, on average, a scant 12 to 15 weeks, during which time they go from being nurse bees inside the hive, taking care of the babies and the queen, to field bees who go out to gather up nectar and pollen, and finally to guard bees who are considered expendable because of their age and who sacrifice themselves if necessary to protect the hive from predators. Making honey is what honeybees do. They won’t stop making honey because their hives are full of honey. What they will do, most likely, is swarm and set up a new hive somewhere else, which takes far more effort than it does to replenish the honey stocks in their hive and decreases their chances of survival by making them even more vulnerable to the parasites that prey on them. Bees always make far more honey than they need to have on hand, and responsible beekeepers never harvest more honey than a hive can spare. In fact, we harvest honey in part to prevent the colony from needing to swarm so that we can help them keep their hives healthy and keep parasites at bay. There are lots of things that are putting honeybee colonies at risk – parasites like the Varroa destructor mite and the small hive beetle, pesticides, and habitat destruction (e.g., mono-cropping and a lack of appropriate forage) are just a few. Harvesting honey is NOT one of them. In fact, responsible beekeepers are the first line of defense against the disappearance of bees because we help the bees control the parasites that destroy their hives and that prey on their larvae. When the Varroa mite and the small hive beetle arrived in Hawaii for the first time 9 years ago, the only bee populations that survived were those in hives managed by Hawaii’s beekeepers. While Hawaii beekeepers lost an estimated 65% of their managed hives due to the Varroa mite, feral bees (that is, honeybees in wild, non-managed hives) literally disappeared on Oahu and on most of the Big Island as a result of these parasites. If you would like to help save the bees, please understand that switching from real, all-natural raw honey that is gathered and sold by responsible beekeepers to a honey substitute like Bee Free will absolutely NOT help save the bees. Planting honeybee friendly forage, avoiding the use of pesticides on plants or trees that are flowering, and supporting small-scale beekeepers by purchasing their honey absolutely will. If anything about managed bees is stressful, it is probably the crop fertilization industry that hauls hives around the country so bees can fertilize vast orchards of crops (in the Central Valley of California, things like almonds, peaches, plums, apples and so on). Certainly honey is a byproduct of that, but the industry is about fertilizing so the farmers get crops. I think it must be stressful to bees to be hauled around, and it is challenging to those beekeepers to keep their bees healthy and maintain their numbers. But small-scale beekeepers with fixed hives are a completely different story. They only harvest honey when there is enough extra for both them and the bees. They wouldn’t do anything to jeopardize the health of their bees. 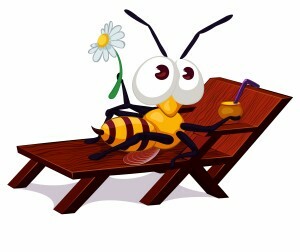 But I am sure some people will fall for the bee vacation pitch — so many people know very little about bees. Thanks so much for your blog. It is worth speaking out about this. Thank you so much for your comment, Katherine. You’re absolutely right — trucking bees around the country to fertilize crops is stressful to the bees because they need to find new food sources each time they move. Of course, I assume they’re taking the bees to a ready food source, so that should help. That said, the farmers that need bees to fertilize their crops don’t have many choices, especially if their farms are mono-cropped. We’re lucky here in Hawaii — there’s food for bees all year round. There is one large beekeeper here that moves his hives around, but most of the beekeepers here move our hives very little if at all. 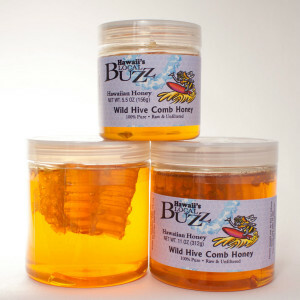 At Hawaii’s Local Buzz we don’t move our hives around because they always have enough forage anywhere on our farm. I can’t tell you how much I appreciate you letting me know you read my blog — it feels very good to know I’m not a tree falling in the forest with no one around to hear it. 🙂 Mahalo nui loa.